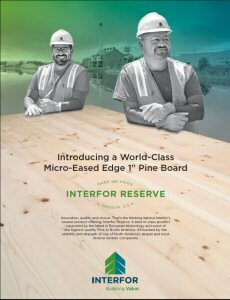 GILCHRIST, OREGON--(Marketwired - July 15, 2014) - Interfor Corporation has turned its Gilchrist Mill into a world-class speciality operation to produce its new top-of-the line Reserve Pine products for the niche premium board market. "Since 2004, we have invested $15 million in mill upgrades, including $5 million to install the most advanced finishing system in the world," says Gilchrist Mill Manager Tony Flagor. "This has put our mill on the map as a premium producer in the one-inch board market while supporting 450 local jobs." Reserve Pine boards are a superior grade product sourced from some of the best Pine stands in North America, and manufactured to Interfor's exacting standards. They are easy to work with and have an impeccable finished look thanks to the mill's new state-of-the-art high-speed moulder and precision planer heads. "The equipment provides the accuracy needed to deliver a superb finish quality on both the face and edges of each board," Flagor said. "We finished installing the system in April, and immediately began to produce Reserve Pine boards. By next year, we expect Reserve Pine will make up half of our annual production." "This investment illustrates the importance of having federal forest policy that works for local employers like Interfor and puts Oregonians back to work in the woods. The House has passed a bipartisan bill to fix federal forest policy to create jobs, improve forest health, and reduce the risk of catastrophic wildfire. It's time for the U.S. Senate to act to get this done for Oregon," said Representative Greg Walden (R-Hood River). Walden is one of the sponsors of a bipartisan bill approved by the U.S. House last fall that would sustainably increase the harvest on national forests and also from federal O&C Lands by placing some of the O&C Lands into a trust managed by Oregonians. Two-thirds of the timber used by the Gilchrist Mill comes from federal lands. This includes slow-growing Lodgepole and Ponderosa Pine from the high plateau of central Oregon, giving them the distinct grain pattern, tight knots and appealing golden color that makes them ideal for producing the new Reserve Pine products. Available in dimensions from 1x4 to 1x12, the Reserve Pine products have a moulded micro-eased 1/16th radius edge and are ideal for fascia, interior trim, general building construction and pattern blanks. Editor's Note: For more information on Reserve Pine visit www.interfor.com/reserve-pine. Editor's note: a copy of the ad can be downloaded from Dropbox.